Shirts With Random Triangles: Benedict Cumberbatch as Doctor Strange on Entertainment Weekly's "First Look" Issue. 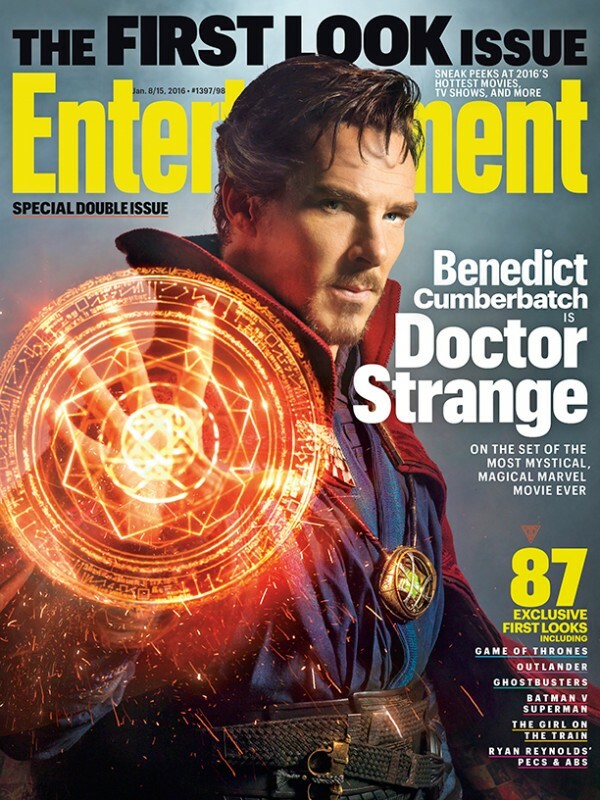 Cumberbatch appears on the cover wearing two of Doctor Stephen Strange's most prominent accessories in protecting the Earth from evil - his high-collared red Cloak of Levitation and the all-seeing Eye of Agamotto. In addition to Cumberbatch, Doctor Strange stars Oscar-winning Best Actress Tilda Swinton (Michael Clayton) as The Ancient One (Yes, the Ancient One is a well-aged Asian main the comics, thank you), Chiwetel Ejiofor (12 Years a Slave) as Baron Mordo, Rachael McAdams, and Mads Mikkelsen (Hannibal). The film is directed by Scott Derrickson (The Sinister films, Deliver Us From Evil). Doctor Strange is scheduled for a November 4, 2016 US release.